As promised here is my fellowship final report. 1,700 hours were spent researching developing and planning; creating and producing; promoting and implementing. With the fellowship funds I met the goals proposed in my application: I increased my capacity, developed my knowledge, and expanded my marketing efforts. As promised, I spent 90% of my fellowship funds within Cuyahoga County. If there was an option to shop locally, I did. 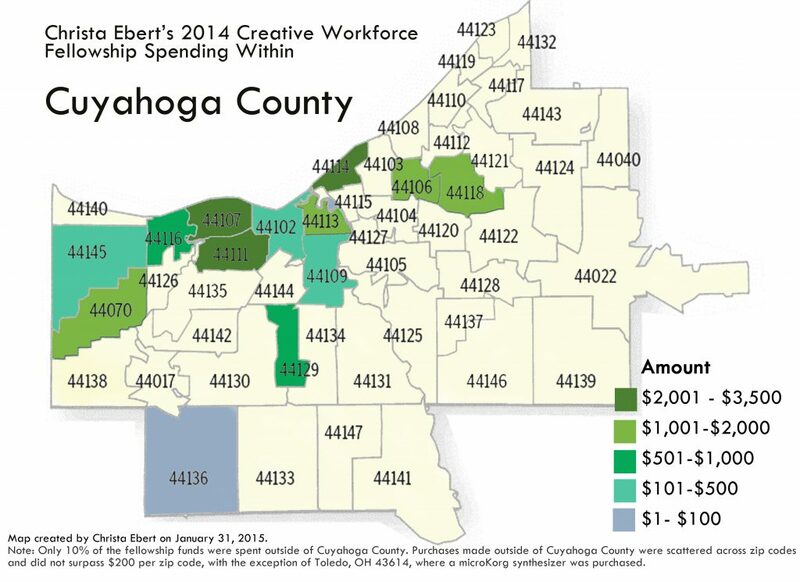 I hired Cuyahoga County artists and paid them a fair wage. I considered diversity when selecting the artists and also chose equally among the sexes. Nick and Tony Cross lent their musical talents on a few of the songs. Adam Boose, audio engineer at Cauliflower Audio, mastered the music. Album artwork was created in collaboration with graphic designer, Angela Ruland, and photographer, Ryan Poorman. Professional seamstress Margaret Ruble of Senjiva Studios created the custom woodgrain dress used for the cover art. Ron Kretch authored my press-kit. Megan Elk gave me a voice lesson. Mike Rodemann designed and screenprinted the t-shirts with the help of his son, Milo. Ian Charnes, director of CWRU’s Think [box] (pictured below), crafted my custom made podium. The list goes on. I couldn’t have accomplished all that I have without the help of fellow artists. I had records pressed at Gotta Groove and my pal Heather Gmucs artistically manipulate the vinyl. I had hundreds of CDs made at locally based AtoZ Audio. 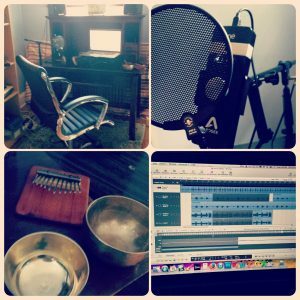 With the fellowship, I was able to turn an empty space in my house into an office/ modest studio that meets my recording needs. I bought much needed equipment including but not limited to: A new Fender 300 Portable PA speaker system, a Boss RC30 loop pedal, an Apogee ONE microphone, KORG Volca Beats drum machine, MicroKORG Vocoder synthesizer, Yamaha Mixer, cables and power supplies, computer speakers, mic stands, and a handful of smaller instruments such as a Melodica (keyboard air), Tibetan singing bowls, thumb piano, and a musical saw and bow. I bought a GoPro camera to help with future music videos, and took a film editing class at the Cleveland Institute of Art (taught by the lovely Lauren Voss). I took classes at the Beck Center for voice and piano. I learned the basics of music theory, how to sight-read, and how to sing this creepy/ amazing Italian Aria Lascia ch’io pianga. My marketing efforts were enhanced by the fellowship: unolady.com is up and running. I am now registered as both the writer and publisher of my songs on ASCAP and secured licensing with CD Baby. My songs are finally on itunes, can be purchased on Amazon, and in the review process for Pandora. I now have a youtube channel with 10 videos posted in the past year. I sent hundreds of emails and 70+ packages promoting the record and booking the tour. Each package contained a personalized, handwritten note in addition to professionally made publicity materials. Despite hours of sleuthing, I couldn’t find Wes Anderson’s address to send him a record. In October, I went on tour, performing in eight towns never played in prior. I also was lucky enough to participated in an invite-only songwriting workshop and was on five recordings made during that week. It was the first time of my life I spent focused on music and nothing else. The Creative Workforce Fellowship was a life changing opportunity. It continue to be a catalyst to my creativity and I am very thankful to CPAC and CAC. Thanks for making such an innovative and supportive program for Cuyahoga County artists. I encourage all artists who are passionate about their city to apply to this year’s fellowship. On Wednesday, June 24, 2015 @ 12 noon, I’ll be speaking at the Foundation Center Cleveland (1422 Euclid Avenue, Suite 1300, Cleveland) about the fellowship and grant writing basics. Register here. Stay tuned for more updates. I’ll be posting more about the fellowship (click here to subscribe). More info on the fellowships can be found here.